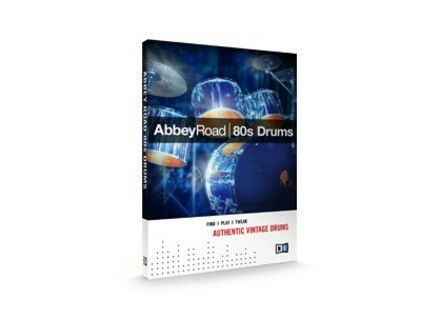 Abbey Road 80s Drums, Virtual Drum/Percussion from Native Instruments in the Abbey Road series. Product replaced by the Native Instruments Abbey Road 80s Drummer. Native Instruments has announced the release of Abbey Road 80s Drums, the third instrument developed together with the iconic British recording studios. 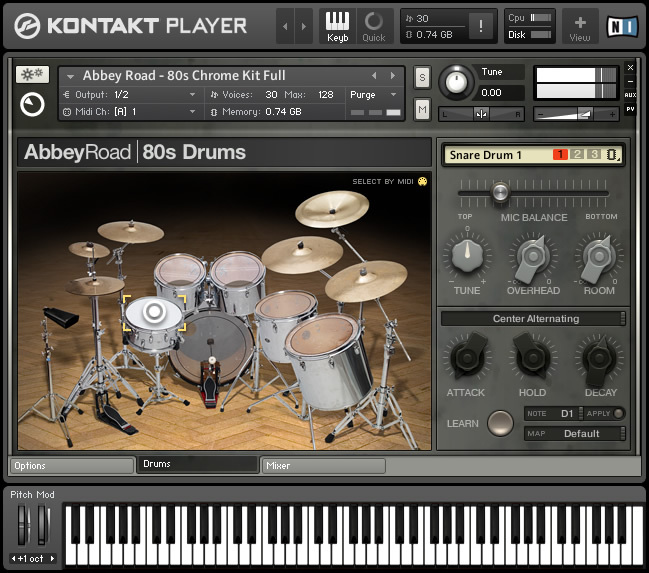 With two engineered drum kits for use in the free Kontakt Player and the Kontakt 4 sampler, Abbey Road 80s Drums is designed to allow musicians and producers to recreate the drum sound of the '80s. Abbey Road 80s Drums contains two characteristic instruments that contributed to the sound of the respective musical decade – a vintage Yamaha 9000, and a Slingerland Magnum Chrome with single-headed concert toms and a full set of Octobans, the melodically tuned tubular toms that were popular among drummers of that time. Both drum kits were set up and sampled in Abbey Road's Studio Two and Studio Three, taking advantage of the acoustic properties of these recording rooms. Abbey Road 80s Drums features implementation of the "gated reverb" technique that enabled the "huge-but-tight" drum sound of the '80s. Different sets of ambient microphones were used at Abbey Road to compressed versions of the room sound, including a mono overhead signal recorded through a STC 4021 "Ball and Biscuit" microphone and a replica of the SSL E-Series talkback compressor, utilizing a popular recording trick of that time. Neve preamps, an analog 2-inch tape machine and other outboard gear contribute to the sound character of Abbey Road 80s Drums. Up to 27 velocity layers per instrument, each with up to six additional variation samples, are designed to guarantee authenticity both for rhythm programming and for real-time MIDI-controlled playing. The user interface offers control over all articulation, sound shaping, mixing and routing functions, with envelopes and volume of the gated ambience individually adjustable per instrument group. Advanced randomization can even add subtle nuances to the tone and timing to make it virtually indistinguishable from a studio-recorded drum performance, the company assures. 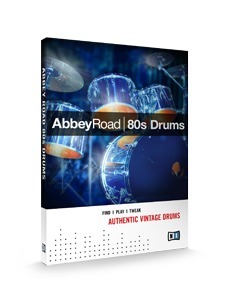 Abbey Road 80s Drums costs €99 and is available for Windows and Mac OS X in stand-alone and VST, AU and RTAS instrument plug-in formats via the free Kontakt Player. Artificial Audio Quartz Updated Artificial Audio has updated Quartz to version 1.0.1. Platinumloops Releases ‘Hip Hop Producer Pack 6 - RnB' This RnB edition of Hip Hop Producer Pack 6 takes you in an electronic direction and offers more of a Pop / RnB vibe, with influences from Lady Gaga, Kanye and Rihanna.